The eagerly anticipated Rangers AGM was more positive than previous years’ editions. After all this was staged in the Clyde Armadillo in the centre of Glasgow rather than in a tee-pee on the Ibrox pitch. The key item of the AGM surrounded Resolution 11 which, if passed, would allow for a new share issue. It requires 75 per cent support to pass, a figure that wasn’t reached last year. However, it is designed to diminish the influence of Mike Ashley and the Easdale brothers, while opening up avenues for further external investment. Results are not expected until next week. Yet there were plenty of other snippets to come out of the meeting, attended by some 700 fans, including mentions of Joey Barton, recruitment, spend, Leicester City and a team in the East End of Glasgow. Here are six things which didn’t quite add up, leading to some head-scratching. 1) “There’s always scope for a Leicester,” said Dave King. This phrase has become ubiquitous in football. It is only a matter of time before it is added to the football clichés lexicon, that’s if it hasn’t already been added. The reason Leicester’s success is revered and mentioned by so many across the footballing world is because it rarely happens. To compare Rangers to Leicester is nonsensical. Especially when Mark Warburton followed up those comments later with his view that Rangers are the biggest club in the country. There is not the level of financial disparity between Rangers and their rivals as there is between Leicester and the competition they saw off. It wouldn’t be a miracle for Rangers to win the league, it would be simply be a fine achievement. At the moment Rangers are third. They have the second highest budget in the country. 2) “The need to strike the balance between financial prudence and deficit funding,” explained King. The club, admirably, wants to ensure they do not abandon financial prudence even if it means resisting supporter pressure to spend. Later in the meeting . . .“We have to spend more than we currently make for a number of years to get club back to where it belongs,” said King. Erm, wasn’t that one of the problems which led to four years out of the top-flight? Yes, yes it was. It is understandable that the club need to show ambition to try and bridge the gap with Celtic. The fans will demand nothing else. But it is a fine line between bravery and stupidity. King did not help himself with previous comments regarding a certain £30 million. 3) “The operating deficit we are running is a necessary compensation for under spending in prior years,” said King. Indeed. After all Rangers WERE very prudent as they made their way through the leagues. 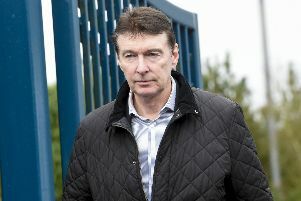 They did NOT spend unnecessary funds on players like Kevin Kyle, Fran Sandaza, Emilson Cribari. Wait . . .
That’s the result of limiting yourself to a small pond of lower-league English players and reserve Premiership players. It is clear Warburton has a reluctance to pursue targets from abroad because they take longer to settle, according to the Rangers boss. Unsurprisingly a question was asked from the floor about this issue. Warburton was asked if the club do have scouts abroad or simply rely on Frank McParland’s contacts. Expect Warburton to continue slinging his bait into the ponds and lochs of Britain. 5) “This remains the biggest club in the country,” stated Warburton. I refer readers back to the comparison with Leicester. The statement is one which curries favour with fans. But it is a debatable point at that. There is no arguing that Rangers and Celtic are behemoths, but currently Rangers are having to progress in the shadow of their rivals. 6) Warburton spoke of Championship and League One clubs in England being able to offer better or equally competitive salaries.
. . . Joey Barton?